I woke up feeling fine in the head and after many mornings spent being green with envy over Polly’s Green Oats, it was time to give ‘em a try! Turns out he liked it! You really couldn’t taste the spinach AT ALL. I would almost dare to say the oats were sweeter than usual!? Stick blend away like Polly! I think she uses more spinach and has a better blender than we do because mine weren’t quite as neon green. Toppings included coconut butter, salty peanuts and a spoonful of PB. That looks great actually! I need to figure out what to do with 4 years worth of textbooks that I couldn’t see back to the bookstore…boooo. Try Textbooks.com or Bookbyte.com. Both have given me hundreds of $$ for my books, although the longer you wait the more likely there’s a new addition and they wont buy it back 🙁 The shipping is free! Sorry about your headache!!! At least it is a new day! Breakfast looks good! I have been wondering whether I shoud jump on the green oats train. I may have to now! Lovin’ the green oats this morning! Breakfast looks delicious! 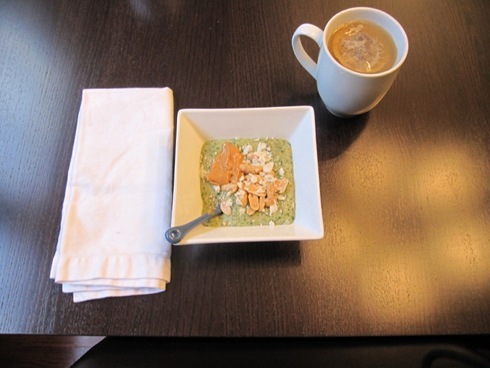 I’ve been hesitant to try green oats….maybe I’ll give it a try- great way to get your veggies for breakfast! sorry about your headache! I’ve had horrible ones all week after the car accident, so I feel your pain. 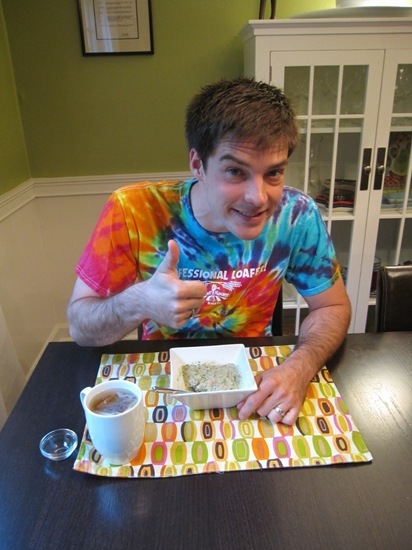 green oats + tiedyed shirt? total hippy breakfast – love it! Woah busy day – have a good one! Those green oats are a fabulous color, by the way! I’ve seen so many of these green oats – I am going to have to try them soon! Did you use a stick blender or a regular blender? You are adventurous! 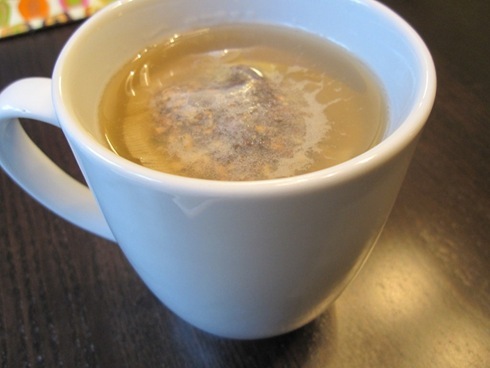 This is one concotion I won’t be trying but more power to you! wow..what an interesting way to have oats! looks delicious! I have not been brave enough to try the green oats yet. Green smoothies are good but I’m not sure if I am ready to mess with my morning oat bran yet. That’s so great the oats worked out! I must try that too. Hmm… still not brave enough to try green oats, but I may be soon. We’ll see. Let me know if the package comes today? I’m not sure I could get past the fact that my oats would be green! Haha. I may give it a try though, but first I might try out the green monster 🙂 If I can gulp down a green drink then I should be able to eat green oats! I really think I’d enjo that, too! Spinach is so mild, and when in a smoothie I think, if anything, it gives a sweet flavor, but that’s all. With oats in the morning–what an awesome start and awesome way to get some veg in first thing! Too bad I don’t have the proper blending tools 🙁 Have a lovely morning and busy day! Glad the green oats got the thumbs up!! They look great! Good luck with your schedule today! Wow! Those greens look good. I may try them, as I’m not feeling my usual morning smoothie today. Glad to know green oats “work” . . . I’ll admit that I’ve been nervous to try them! Interesting experiment. I love green smoothies, but I don’t think I’m ready for the oatmeal version. Yum those oats look good! such a pretty color. I jumped on that bandwagon last week. 🙂 I agree with you…absolutely no spinach taste at all and I think they taste sweeter, too! Raw spinach? Just blended in? Huh. Seems like a pretty good idea. I don’t have a stick blender, though, I guess I could Vitamix water and spinach and then just cook the oats in the mixture? The more greens, the better! that looks really cool! It is always great to mix things up a bit for breakfast- the same old oatmeal routine can get boring! “A bazillion guest posts” I worry for you girl!!! LOL. When you said 50 I was like dayum!!!! Good luck with your to-do-list! So sorry about the headache! I hate having a headache! I made your coconut hummus last night, loved it!!! Don’t be shy with the spinach! I agree with you..the spinach really does make it taste sweet! And I find it ironic Kath that you’re doing an article on lowering your grocery bill, as you have no problem plunking down $15 (including shipping here) for a JAR of almond butter, or buying expensive yogurt and other organic products (like cereal). Saving money on groceries is what I (and much of America) do: not buying organic (which is, gasp!, perfectly OK), buying the .50 cent fat-free yogurt, and the 26 oz. of Smuckers PB that tastes awesome. I’m sorry this comes out as hypercritical. your green oats look good I just dont know if I am brave enough to try them! I know personally, when I get a headache (whether from lack of caffeine, hunger, dehydration), nothing will fix it but an Advil or aspirin. Had one yesterday (headache), wandered around the lab until I found someone with the stuff. Works wonders. I love oatmeal…will have to try this recipe. Jennifer – you should check out the months of november and december. Kath and Matt put a LOT of effort into lowering their food bills and spent way less than I ever have AND they did so very healthfully. That is a good point Ryane. I am thinking outside those months though. I am not sure about all of their food, but I know that a lot of the pb and bars that Kath eats are free from the companies so that she will review them for the blog. While that in itself is a way to save money on groceries :), I think they do a great job of comparison shopping and trying to “eat what’s in the pantry” before splurging on expensive foods. Her article should be interesting! Amanda- good point too, I hope Kath mentions how a lot of her goodies are free, so that obvi save on grocery bills. Also I think it’s a cost-saver per person when you split groceries. My bf pretty much doesn’t eat ANY of the food I eat, so my wallet has to fend for itself. I love oatmeal. I love spinach. I never thought of eating them together!!! Sounds interesting! spinach oatmeal? what will you think of next?? 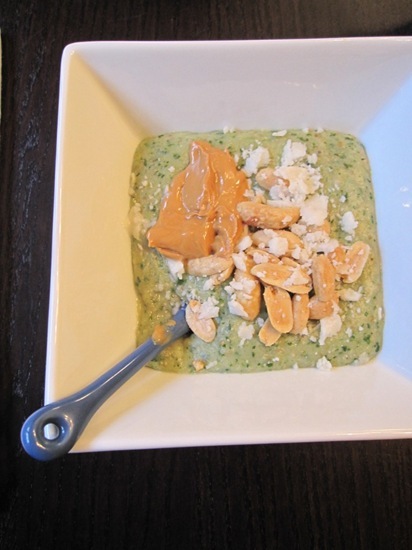 I’ve never seen anyone eat green oatmeal until now but that makes perfect sense! Oatmeal’s neutral taste, serves as a great base for salty or sweet fixings. Thanks for sharing Polly’s website with us! You know, I’ve done the same thing with a headache. One time, it started so slightly and got horrible but I didn’t have access to Advil. I suffered for 6-7 hours…then took Advil and it was better in about 5 minutes…why did I make myself suffer?! Hope you feel better. I’ve seen Polly’s spinach oats and it intrigues me but makes me nervous. I may have to try it sometime! Green oats…just one more brilliant thing we can learn from Polly. Whoa! 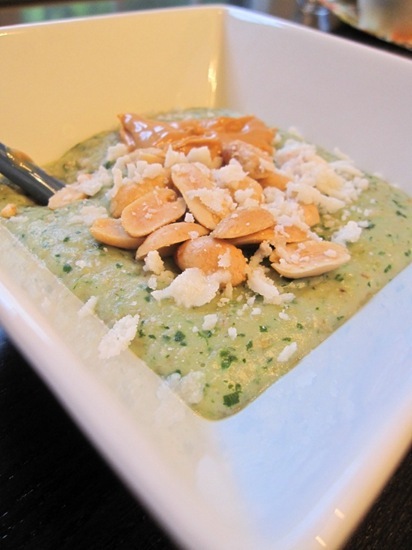 Spinach in oatmeal? Wow. I’ve never thought of that. I’m going to have to try that. Interesting. Very interesting…. Loving the green oats this morning. I’m totally wishing I had a stick blender right about now to try this out! Definitely a great way to get in a nice serving of veggies to start the day out! Smuckers Natural PB!!!!!!!!!!! So gooooooooooooooooood. And only $5 for a 26-OUNCE Jar!!! I make green oat bran pretty much every day, and I’ve gotten to the point where I’m putting in about 3-5 cups of spinach. As long as you have something sweet (like banana or peanut butter) cooked into the oats you really can’t tell about the spinach. I use a food processor to do mine. Glad you tried it and liked it 🙂 I’ve had Bobby try mine and he agrees that you can’t even taste the spinach. heather- Whole Foods has a great, all natural PB i buy and and it’s decently priced for the big jar! About $6. I think it is much better that Smuckers Natural, which i used to get all the time until I had the WF one. Get OVER the Barney Butter – sheesh!! I buy one jar a quarter and eat it slowly (you haven’t seen it recently, have you?) We have drastically cut our grocery bill from where it used to be – cutting back on meat, extras and fancy ingredients. Sure, we still buy goat cheese and smoked salmon every now and then, but not nearly as much as we used to. Our bill is less than 50% of what it used to be. It’s all relative to what is comfortable for your household. And obviously I get lots of freebies – but that’s no secret. I’ll remind you too that we get all of our bread for free! I’m not going to recommend working at a bakery for the bread, but I would recommend checking out Matt’s blog about how to bake your own. Just because I buy Barney Butter or get free bars doesn’t mean I don’t have good advice for cutting your grocery bill. My two very favorites are Smucker’s Natural and Trader Joe’s – they are both salty and peanutty. I love the flavored ones like Naturally Nutty and EarthFare’s too, but overall I like ’em salty and nutty. I used to put steamed chopped broccoli in my son’s baby oatmeal when he was a year old. I buy organic natural peanut butter from Costco. Pretty cheap (about $2 a pound). I am interested in reading more about how you cut your grocery bills. I am *very* much liking your blog – so healthy, and the kind of food I try to eat and feed my hubby and 3-year old. It doesn’t have to be expensive. I spend way less on food than most of my friends. The last couple of years, we’ve been at $4900 a year. This doesn’t include eating out, which is about $100-150/month. I’m on track this year for finishing the year at under $4000. That includes $850 for the local, organic CSA that runs 10 months of the year. The farmer’s market. The nuts, seeds, almond butter, occasional seafood, goat cheese,and smoked salmon. Of course, I have spent the last 8 years or so actively trying to reduce our grocery bill (it’s a hobby.) We are mostly vegetarian, which helps. Thanks for your comment!! Check out the KERF archives from last November. We cut our bill down to about $25 a week for the month. It was hard, but it took a ton of planning. And of course that was for 2 people. If you search for “Thanksgiving Challenge” you’ll find more posts from the month about groceries. I’ve had an ITouch since Christmas, but your posts have got me fiddling with the app store to figure out what I can get for free since I don’t have a credit card, lol. Thanks! Actually, I was thinking of you today when I applied to work at a local bakery. I started looking around to see what kinds of bread they had before I realized I hadn’t even glanced at the sweets! I guess all the yummy breads you buy are tempting me, lol. I am always wanting to try polly’s green oats. I am just procrastinating on it!! Does Great Harvest ever share their “scuffin” recipe? I’d love to try it, but understand it may be top secret! I can’t wait to try the green oats! I really love all your combinations! I also love that spoon you have in your bowl haha. Where did you get that adorable spoon?